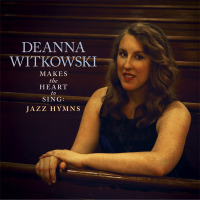 On one level, pianist Deanna Witkowski’s Makes the Heart to Sing: Jazz Hymns is a luminously lyrical trio session interpreting a spiritually charged body of music rarely investigated by jazz artists. But Witkowski, an award-winning composer, has a far more ambitious agenda than introducing the jazz world to the sizable treasure trove of hymns woven into the weekly liturgy of churches across the Anglosphere. The winner of the 2002 Great American Jazz Piano Competition, Witkowski has released six critically hailed albums over the past two decades, with each new project revealing a steadily evolving sensibility marked by melodic invention and emotional connection. As an accompanist, she’s toured with soul-steeped vocalist Lizz Wright and held down the piano chair for ten years in the Jim McNeely–led BMI/New York Jazz Orchestra. Her projects as a leader feature fellow heavyweights like bassist John Patitucci and saxophonist Donny McCaslin. Witkowski talks eloquently about the primal, transporting power of group singing, and her trio brings a similar collective ethos to the music on Makes the Heart to Sing. She’s played with drummer Scott Latzky since she settled in New York City two decades ago, having moved with a full-time job as a church music director, while bassist Daniel Foose is a more recent collaborator. What’s most striking about the project, aside from the sheer beauty of the trio’s feel and dynamics, is the seamless way the hymns slide into the jazz idiom even as Witkowski pays close attention to the contours and meaning of the text. The majority of the tracks clock in at less than four minutes and focus on the group’s irresistibly swinging interpretations rather than using the themes as launching pads for extended solos. The album opens with the Welsh tune “Cwm Rhondda (Guide Me, O Thou Great Jehovah),” a lush mid-tempo ballad that feels like it could be the romantic declaration from a 1940s Broadway hit. “There Is a Balm in Gilead” glows like a languorous Bill Evans ballad, while the brief “Holy, Holy, Holy” rises with the grandeur of an Ellingtonian theme. The trio delivers “We Three Kings” with such swinging authority it seems inevitable as a jazz vehicle, and “How Firm a Foundation” unfurls with the rolling cadences of a gospel music hit. Likewise, Witkowski finds an ideal groove for Beethoven’s immortal “Joyful, Joyful, We Adore Thee” from the Ninth Symphony. Not every tune is designed for vocals. Witkowski offers several ravishing solo improvisations, including two very different takes on “St. Elizabeth (Fairest Lord Jesus).” And the album’s longest track, “Lord, I Want to Be a Christian,” moseys at a Shirley Horn tempo that would confound most singers. Ever since Mary Lou Williams premiered St. Martin de Porres (Black Chris of the Andes) in 1962 at St. Francis Xavier Church in Manhattan, jazz musicians have explored different avenues for bringing jazz into settings for worship. But Witkowski’s thoughtful and deeply felt work setting traditional hymns in a jazz context has few precedents. In many ways, her creative identity is built on her gift for gracefully bringing together seemingly disparate elements, though Makes the Heart to Sing flows directly from her longtime work in sacred settings. Born in Exeter, New Hampshire (March 20, 1972), Deanna Witkowski grew up around the northeast, and by high school her family had settled in Rochester, New York. Both of her parents had musical backgrounds, and her three younger siblings also pursued various music studies. At home, she played an electric Organaire, and when she started kindergarten her teacher was struck by Witkowski’s knack for the piano, suggesting to her mother that she start taking lessons. Witkowski actually studied violin for a year before she started piano and flute lessons in the fourth grade, and she pursued both instruments intently through high school. As a piano major at Wheaton College outside of Chicago, Witkowski caught the jazz bug. Exploring the alto saxophone, she started studying with Larry Panella (now director of the University of Southern Mississippi’s jazz department). She was serious enough that her first summer home from college she took a six-week course with pianist Bill Dobbins at the Eastman School of Music. Back at Wheaton she connected with Brad Williams off campus, and he turned her on to Bill Evans, Erroll Garner, and other masters. She began a master’s program in jazz studies at DePaul and played in Bill Russo’s Chicago Jazz Ensemble, but didn’t complete her degree until years later at City College after she had moved to New York City. The cauldron of the Chicago scene provided plenty of stimulation. She started writing for liturgical settings, got a gig accompanying a Brazilian singer, and was recruited to play in a salsa band. She also started leading her own combo, Odd Fish Quintet. Each situation provided numerous opportunities to stretch her wings as an arranger and composer. Though guitarist Russell Malone encouraged her to move to New York City after they played together at a Montreal International Jazz Festival session, Witkowski hesitated to take the leap. In 1996, she studied with Cuban piano maestro Hilario Duran in Toronto, and the next year All Angels’ Church in Manhattan hired her as music director. Witkowski made her recording debut as a leader with 1999’s Having to Ask on her Tilapia Records label, an album that earned her accolades from Jazz Journal International as “one of the best of the new generation of jazz pianists.” Already well on her way to forging a personal synthesis of jazz, Brazilian, and Afro-Cuban influences, the pleasingly fluent album documents her working Chicago band. She followed up with 2003’s Wide Open Window (Khaeon World Music), a tremendously accomplished quartet session alternating her originals with standards, mostly by Cole Porter. Much of the music was inspired by her collaboration with powerhouse tenor saxophonist Donny McCaslin. Witkowski’s 2005 release Length of Days (ArtistShare) confirmed her status as one of jazz’s elite artists. Introducing eight arresting originals (and a beguiling arrangement of the Ellington classic “I’m Beginning to See the Light”), the quartet session once again pairs her piano and vocals with McCaslin’s tenor and soprano saxophones. Bassist Dave Ambrosio and drummer Vince Cherico provide superlative rhythmic support throughout. On her fourth album, 2009’s From This Place (Tilapia Records), she set ancient and modern sacred texts to jazz-steeped scores, exploring an array of formats from a three-part women’s a cappella to an instrumental quartet. And 2015’s gorgeous Raindrop: Improvisations with Chopin (Tilapia) is a solo piano session that seamlessly combines jazz, Chopin, and the music of Brazil. With Makes the Heart to Sing, Witkowski taps into another deep tradition, using jazz to breathe new life into the communal experience of worship. Whatever one’s faith, it’s easy to understand the abiding power in coming together in song. Witkowski cites the thinking of charismatic choral composer Abbie Betinis, who helped launch the brand-new Justice Choir Songbook to provide demonstrators with material beyond “We Shall Overcome.” (Witkowski’s song, “We Walk in Love,” is one of 43 songs in the book selected from a national call for scores). All About Jazz musician pages are maintained by musicians, publicists and trusted members like you. Interested? Tell us why you would like to improve the Deanna Witkowski musician page.